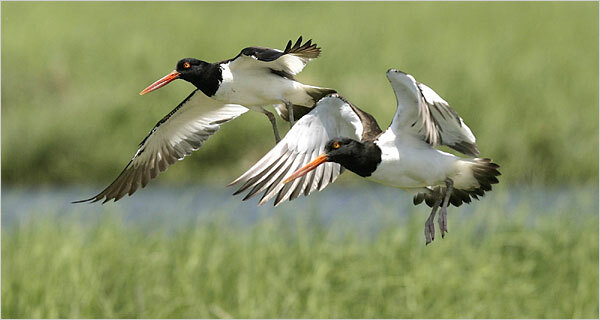 American oystercatchers over the dwindling marsh grasses of Jamaica Bay. Credit: Kathy Willens, AP. Jamaica Bay is often referred to as New York City’s “ecological crown jewel”, and it is indeed a spectacular location to view migrating birds or catch large sport fish like striped bass, among other positives. However, the bay has some serious problems for which no solution is in sight – pollution, erosion, and storm surges, the latter of which also seriously threatens the safety of people in surrounding neighborhoods. One issue affecting the bay and its human neighbors is the loss of marshes and the erosion of their islands in the middle of the bay. The entrance channel was dramatically deepened, the volume of the bay has increased by 350%, and every year the system becomes more like an oceanic bathtub than the system of interconnected islands and brackish tidal marshes that once existed. Sea level rise threatens to worsen matters, and the news has only gotten worse in recent years – rapid glacier melt at locations like Greenland may increase the rates of sea level rise beyond what was recently expected. But at this point, scientists have multiple competing theories for the past erosion, and there is no plan for dealing with sea level rise. 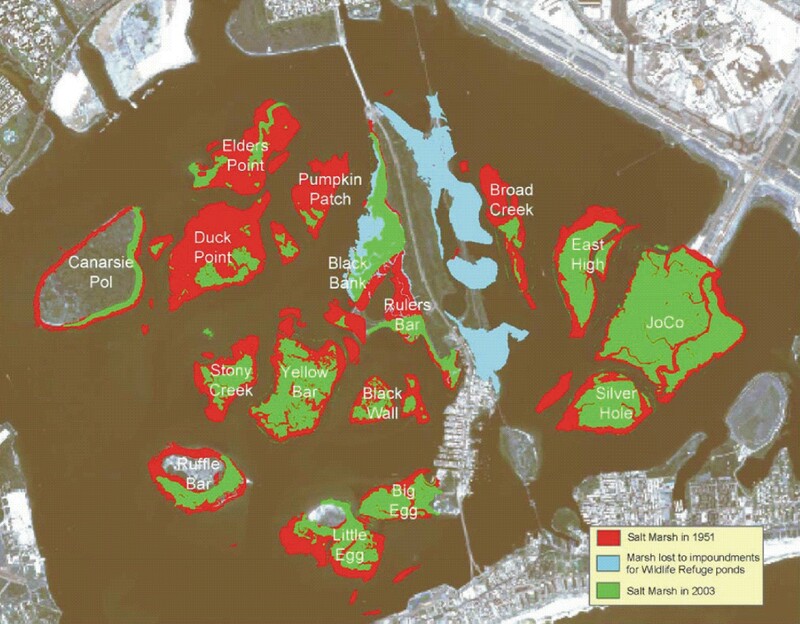 Red and blue regions mark salt marsh losses since 1951, and green areas show marsh area in 2003. Source: http://nbii-nin.ciesin.columbia.edu/jamaicabay/jbwppac/JBAC_NPS_SaltMarshReport_080207.pdf. The marsh loss is not only an ecological problem, but a human vulnerability problem. Hundreds of thousands of Queens and Brooklyn residents in the watershed live on land within range of a realistic 10-13 foot hurricane storm surge. Moreover, a reasonably likely sea level rise of 3-4 feet this century would mean that a bad nor’easter will lead to flooding levels as bad as one of the historic hurricanes we’ve been fortunate to elude for the past century – the worst nor’easters (e.g. 1992) have an annual probability of occurrence of roughly one in ten and cause surges of about 7 feet, so adding 3-4 feet “puts them over the top” and can lead to overtopping of Rockaway and Coney Islands, as well as extensive inland flooding. Before we modified it, Jamaica Bay had a much shallower entrance channel and plentiful marshes, both of which likely protected inland areas by attenuating storm surges – the system used to attenuate tides, whereas now tide heights increase as tides flow from the entrance to the inner reaches of the bay (see this point made in a published paper). Tides and storm surges have many similarities, so if tides are amplified as they move into the bay, a hurricane storm surge will likely also grow in size. In my current research on storm surges using the Stevens Institute sECOM ocean model that underlies the Storm Surge Warning System, I hope to quantify this flooding vulnerability, how it has changed with past modifications of Jamaica Bay, and how vulnerability could be reduced in the future. 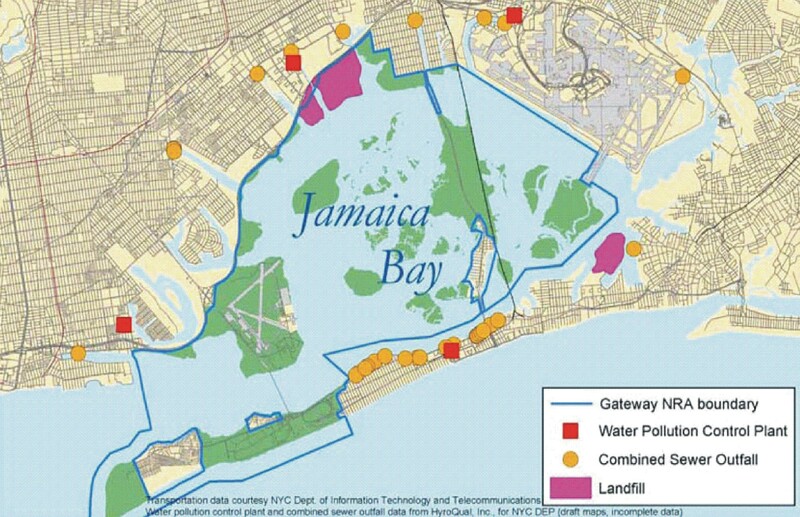 Another problem with Jamaica Bay and surrounding communities is that raw sewage spills occur several dozen times per year when it rains over the bay’s watershed. These occur when rainfall rates are fast enough to overflow the sewage treatment plant reservoirs, and force “combined sewage overflows” – releases of the mixed rainwater and sewage to Jamaica Bay through sewer pipes. Even when the system completes the sewage treatment process, the result is 300 million gallons of sewage effluent discharge per day that is high in nutrients and causes low oxygen dead-zones in the bay. These dead zones have been known to cause large fish die-offs that can clog and stink up the dead-end canals that run up into some neighborhoods. The good news is that NYC has committed to reducing nutrient discharges in the effluent by 50% over ten years. Unfortunately, temporary sewage storage tanks or treatment facilities that move effluent offshore to the open ocean can cost billions of dollars, so this is a very expensive problem to solve. This entry was posted in opinion, water and tagged CSO, dredging, effluent, flooding, Jamaica Bay, marsh, New York City, nutrients, restoration, sewage, storm surge, treatment, vulnerability, watershed, wetland. Bookmark the permalink.